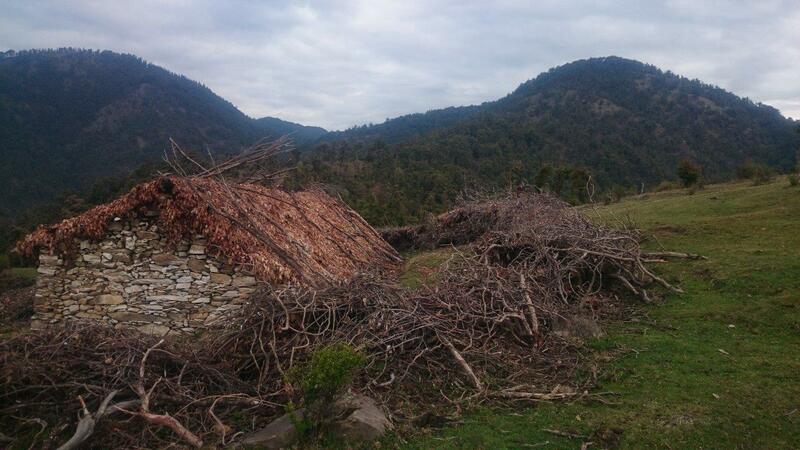 It’s been a tough pre-monsoon season in the Indian Himalaya. The weathergeek has reported rainfall of three times the average and for more than a week we struggled to get any flying in between thunderstorms. On the bright side, all the rain meant the visibility was the best I’d ever seen – although still poor by New Zealand standards! Initially intending to spend only a few days in Bir before setting out east to vol biv towards Nepal approximately 400km away, we kept delaying our departure date. Bryan was the motivating force behind the project and noted that we could fly in the hours before the afternoon rain, but he was the only one with a tent – Glen and I weren’t really enthused with our bivvy bags. Toby had been persuaded to join in but when the good weather finally came he was in bed sick and we could only delay our departure by one more day – we’d waited long enough, and Glen only had a couple of days before he had to return to work. So we set out finally with good weather forecast for a few days starting on 9 April 2015. Bryan had planned our route around 15 waypoints which traversed a similar route to that flown by Luc Armant and (independently) the Himalayan Odyssey expedition, with most passes at approximately 3000 metres. Reading Luc’s account I was worried about the prevalence of trees, and this certainly was a challenging aspect of the trip. There were landings but generally none of them were very good and you’d often rely on some good luck to find a place to launch. The trees extended up to 3500 metres and snow gullies dropped below, although at that level snow was very patchy if not completely melted. 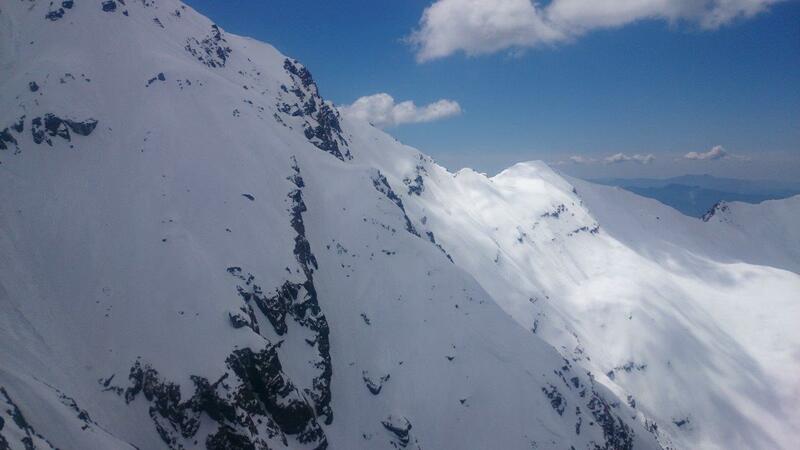 On our first day of flying cloud base nudged up towards 3150 metres, which meant we were never far from terrain. On the next days we were treated to heights of up to 4700 metres but still the flying was much lower and much warmer than we had expected. On the final days cloud choked off the mountain passes in the mornings and steadily built to towering cumulus delivering rain, lightning, and thunder by lunch time. The Slovakians proved it was thermic by mid-morning so we took off but it was a few hours of scratching until we were able to cross over the back. Bryan was first over but had to walk up to relaunch as he arrived a little low (like I did the other week). Glen and Kat followed soon after the first clouds started forming, and I struggled at the back. It seemed my timing was out or my scratching just wasn’t good enough but finally I was working the wispies at Hanuman after much frustration and although I couldn’t get high enough to guarantee the next thermal I had certainly had enough of the stable conditions out the front. Landing over the back I relieved my bladder and then spent a bit of time getting snagged on bushes and clumps of dirt on the terraces while the others flew on ahead. Finally I got in the air and started soaring the spur just as Michael came to join me. The next spur up valley had a good sheltered face feeding it and I was able to get to cloud base and head off on my own at last. 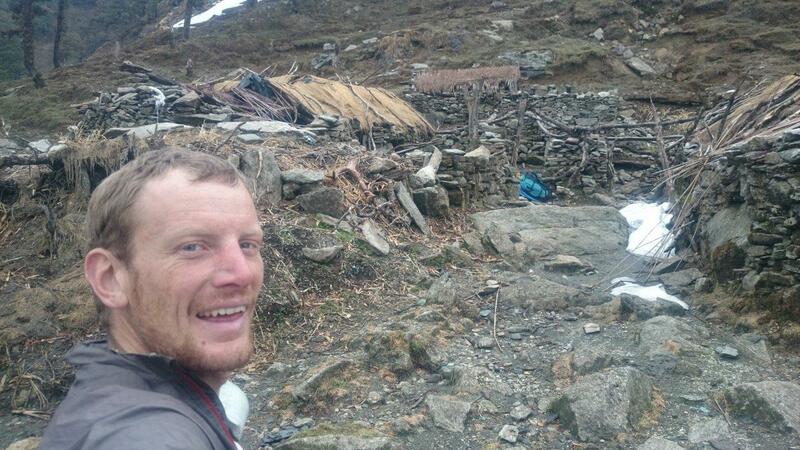 We were all in radio contact and I caught up with Stuart as we reached the impressive high bluffs on the eastern stretches of the Uhl valley, the snowy Himalayas stretched out in a panorama to the north. This was one of the scenic moments of the trip, above the inversions out the front the visibility was really incredible. After making the long crossing to Prashar lake, one of our waypoints about 50km along, Stuart elected to call it a day while Bryan and Glen who had landed nearby took off to join me. 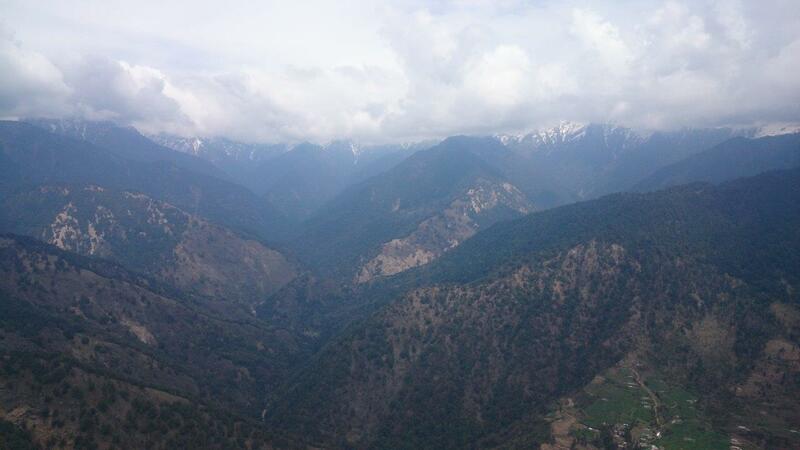 We climbed over the maze of connecting valleys and crossed the Beas, hoping we wouldn’t have to land there. After climbing out of a side valley we continued over shallow valleys with cloud base far above us. Spotting a snowy hill in the distance we closed in on it and top landed there together, the altitude 3150 metres matching the peak cloud base height of the day. Some locals greeted us at the small temple before returning to their village, and we set up camp in the setting sun. Selecting one of the open fire pits we cooked dinner before retiring for an early night under the stars. Spirits were high as we woke to clear skies with a little frost on the bivvy bag. It seemed the weather had finally changed. Our hill was a good thermal trigger but the launch was on the wrong side. I talked Bryan out of launching where we were, given the limited landing options it was worth walking for ten minutes to a (somewhat) grassy spur. With my harness packed to the brim, sleeping bag and overflow bag clipped to the risers, and wearing way too much clothing, I preferred to err on the side of caution in the stable conditions. But Bryan took off and went straight up and we followed. 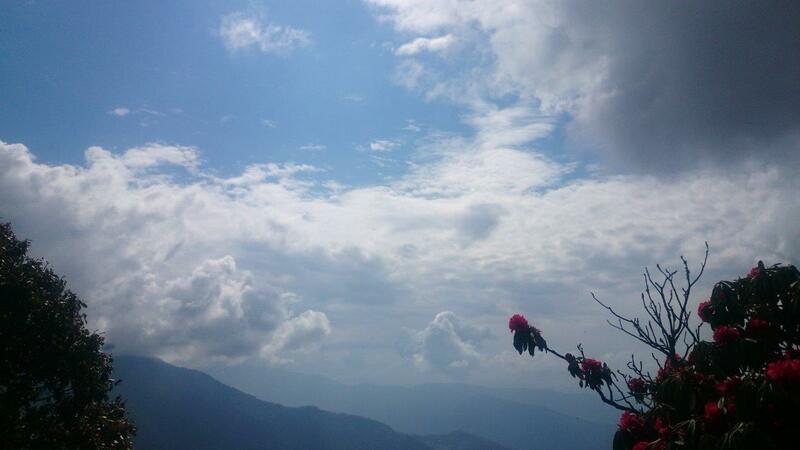 The views were amazing with blue skies all around except for the distant Dhauludars (behind Bir) which had well defined cumulus bubbles along its length. We worked our way east along the hills and were slowed a little by high level cloud dulling the sunshine. As it returned we crossed to the first big snowy thing of the trip. It’s still one of my favourite moments of the trip as I joined Bryan in an unlikely place for a rough and tumble “chunky” thermal finally worthy of the Himalayas. Both the air and the scenery was finally a bit more like how I might have expected it. Another major valley crossing (the Sutlej) followed and Glen elected to land while he still had a chance to get back to civilisation. Bryan and I continued but the cirrus slowed us down again. We slowly scratched up impressive cliffs, observing an improbable road being built directly into the sheer face across the valley – it was a first for me to hear a detonation whilst flying. Bryan’s close in scratching style seemed to work better for him and he followed light lift further up the valley while I opted to return to the same face and wait for more sun. By the time it came Bryan had almost managed to get high enough in light lift to cross the snowy mountains, but the kicking thermal I’d taken in the meantime was enough to cross through the col and Bryan joined me there instead. Popping through the col we sank down but a couple of ridges further on we got straight back up again. A vulture joined me and we looked at the next snowy ridgeline we had to cross. A cumulonimbus was building above but the cloud further to the south looked entirely manageable. Still it was prudent to get going, so we left the vulture. I managed a buoyant glide under the cloud while Bryan flew low in the shade before finding a thermal. At the edge of the cloud I spiralled to stay out as the lift was stronger, Bryan meanwhile pushed bar and got a little icy up there. He popped out to join me some minutes later and we had a long glide into the Tons valley. There was a climb but I didn’t linger there because Bryan was miles ahead, thawing out and following the long rocky ridge. Even when this didn’t work I thought we’d find a climb on the sunny windward slope of pine trees across the Tons river but it was wind affected (possibly by other storms), so we ended up landing in the village, at 5:45pm we’d used most of the day. Starting shortly after 6am, it was a nice walk through open pine forest and later some rhododendron flowers on the ridge with snowy peaks visible in the gaps. Rounding the corner to the southern face we were relieved to find a suitable space in the trees to launch, just as we started to hear whistling in the pines. Flying east we crossed into bigger mountains and it was another good day. Leaving the tree covered hills I enjoyed thermalling up the shady lee of a handsome peak with footprints (Thar or Chamois?) in the snow. I’d encountered a couple of patches of appreciable turbulence and wanted to get a better feel before diving in so I was a little slow to climb up alongside the vultures. When I went on glide to cross the next high snowy ridge Bryan was already returning from a failed attempt, with 65km/h ground speed. I continued ahead and he caught me later on in the Bagarathi valley as we rushed to try and cross the next range before it overdeveloped – it was already raining up the valley under dark cumulonimbus. I was a little higher and pushing towards the pass when a knot slipped with a bang. Suddenly without speed bar I felt naked. I landed shortly afterward on a clearing on the ridge and quickly fixed the problem, but not before I heard the rumble of thunder. The wind became light and variable and gust fronts passed through. I decided to pack up and walk. Bryan was hovering overhead but ended up landing nearby but elsewhere. A seemingly stunned young shepherd watched me pack up, and I set off up a good track along the ridge. There were some ups and downs as the stone path weaved around waterfalls but it was good going. I passed a group of monkeys. Finally the thunderstorm set in and I got wet as I neared the shepherds village on the pass. Ken an American expat living in Taiwan greeted me and Patan the dhaba walla (restaurant manager) welcomed me into his humble abode for a hearty dinner, trading off the wet and the cold for stifling wood smoke. Remnants of last night’s humidity were disappointingly evident in the morning. I climbed up to a grassy knoll I’d spotted the previous day and prepared for an early launch. 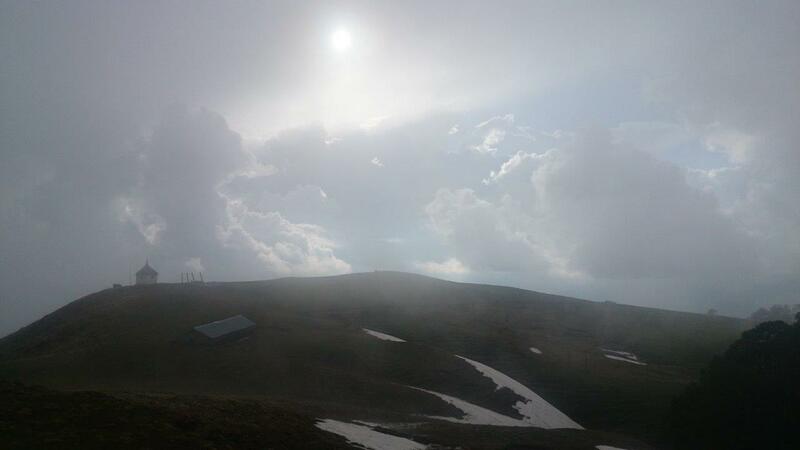 The sun had already consolidated the cloud onto the high ground, it was completely overcast with base a few hundred metres above the 3400 metre launch. From around 10am I soared the southeasterly but as I began sinking I pushed out to the lower hills for sunshine. I scratched there and got some small climbs but the sun was dimmed by thick altostratus, so I crossed the valley to land on the upper limit of terraced paddy fields to save what height I still had. A young guy in a ironed shirt asked me if I had permission to fly – was he a policeman? I said I was going “up”. I again felt overdressed and over-prepared, with a heavy backpack I wondered whether I should hike up the hill or wait for more sun where I was. When I saw Bryan fly past and climb out on the same spur I’d flown I decided I would try and launch. It was tricky due to the terraces and limited gap between trees but it should have been possible especially with the valley breeze kicking in. I would have liked to have t-shirt and shorts but I had to wear my clothes or leave them behind. I was close to getting off a number of times but I didn’t manage. It was stiflingly hot and the growing numbers of amused spectators from the village didn’t help. Every so often someone would shove a mobile phone in my face but Indian’s have no concept of personal space – I didn’t want any help. My mood deteriorated as my wool underlayer and down jacket became drenched with sweat, my glider picked up prickles and vegetative debris, dung, and ash, and time drew on. Finally the local policeman (so he said) was the last person to insist to take my details, keeping his cool even once I’d finished yelling at him. At this point I gave up, he copied my passport and visa specifics, offered me water, and after a call to the Colonel in Bir asked if there was anything they could do to help. Short of making the sun come out (it was still thick altostratus) I couldn’t see how they could assist me so in despair I packed my gear and wandered off up the hill. I needed a walk to cool off and a small waterfall ten minutes in was a good opportunity for a rinse off. I climbed up past a village, ignoring the whistles and insistent cries of “hello!” (they could well have been trying to tell me that I could save a lot of time on a better walking path! ), and found a hollow tree to shelter under for the night as the afternoon thunderstorms got established. In the morning I received a text from Kat in Bir passing on a message from the Colonel, “The police of Uttarakhand contacted me and asked if they have permission to fly. 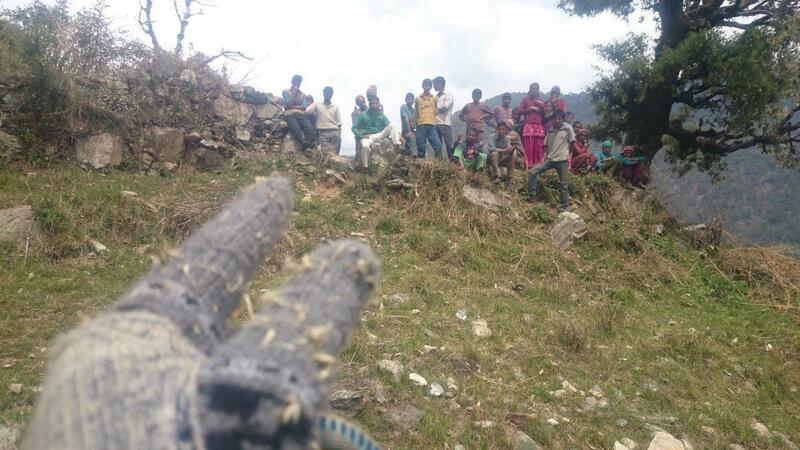 Tell them they will get in trouble if they fly.” This was really disturbing. Facing a long walk out, the last thing I wanted to do was deal with these guys again, although I entertained thoughts of being questioned in Delhi when trying to leave the country and became quite worried. Still, I continued walking to the steep grassy clearing I’d spotted further up the ridge and decided to stay discreet. I would ignore the message and even considered deleting it or making it look like I hadn’t received it. Arriving early (around 8am) I put my backpack in the shadows and did some quick gardening, removing twigs and sticks from the steep grassy launch. I then hid away again and waited, despite obvious thermal gusts on the launch I really wanted to avoid landing in the same valley. Besides, cloud base was around 3000 metres, touching the hill I wanted to fly past and obscuring the previous day’s launch where I had considered flying back to, waiting at the dhaba for good weather was an option to consider. Finally I launched and flew up into the wispies, maximizing my height for the valley crossing to continue on Bryan’s route of the previous day. I arrived high but it wasn’t working on the shady face and I didn’t want to push too far around in the same valley so I dropped back to the sunny spur behind and scratched up from down low. With a significant southeasterly blowing I took a deep route away from the towns, waiting on a spur to get enough height to cross a col. I only made it over by a few metres, literally flying around trees. On the other side I tracked back up the valley, definitely an inefficient V shape back to the course line but I was enjoying the flying. I crossed to a shady spur and slowly worked it, trying to get enough height to cross the next pass as the towering clouds rose higher and cast their shadows. I was close but didn’t manage it, so on my second attempt I made a rather desperate landing in a small clearing surrounded by high trees. A couple of bemused shepherds watched and helped me pack up and as soon as I started walking up the hill the rain started, followed shortly by lightning and thunder. There were plenty of campsites on the grassy knolls but they were all sopping wet and I didn’t like my prospects. I continued climbing past a small monastery and a locked mountain hut, eventually finding some thatched grass roof shepherd huts, one of which had an elevated straw bed. Although I’d heard voices and music in the distance earlier there was now no-one around. I tried my first fancy dehydrated meal (fancy since it was about twenty times the price of a fully prepared local dish, and ironically, Indian flavor too) with a lump of solid fuel to heat up the water. I added a normal pack of noodles and bolstered the whole thing up with generous spoonfuls of ghee (high energy butter fat). Cloud swirled around with no thoughts of flying to be entertained in the dying phase of the storm. Happy to avoid the bivvy bag! Peering through the gaps in the stone wall of the hut I saw white. Indeed cloud was still swirling around and this was certainly a disappointing start to the day. I continued back to the knoll where I could launch and started to wait – cloud base was still well below me. Finally I launched soon after 10am to avoid being trapped in white out. Orienting myself once I was beneath the clouds I looked for a pass that I could cross. I tried for several hours to climb up the shady spurs but the passes were only sometimes visible through gaps in the cloud. Pushing up valley I worked my way to a last probable crossing. After a very slow period of scratching I reached cloud base and flew into the wispies as far as I dared, but still it was a very doubtful glide to make it over the pass (about 2900 metres). In the end I needed to be about fifty metres higher, or not even. I could have landed in a small patch of grass close to the pass but with trees along the entire skyline I could not be sure I’d be so lucky as to find a spot on the other side. I retreated intending to climb up again for a second attempt but sunk lower and eventually crossed the valley aiming for a sunny face. Low here I saw it was time to call it a day and landed in the valley. To lose the last 100 metres I threw big wingovers as it was starting to rain. On the ground I bunched up immediately and walked straight to a conveniently located corrugated iron and concrete structure for shelter, while the rain started to pour. Half an hour later I was walking into the town while an impressive display of lightning thundered close around the surrounding peaks. The town was in the middle of a festival and I got some local food before catching the ride on top of a jeep down valley, and another lift to Ghansali, where I booked into a hotel. Bryan was going through the last of his food and having similar experiences. The last day of flying had reminded me of overcast Canungra and you could have been anywhere – the vegetation and wildlife, villages and terraces were pretty but we’d come to fly in big mountains not flirt with clouds in the valley before they dropped rain all afternoon. Finding launches was the other issue, which had apparently delayed Toby for days until he finally had to withdraw after a hard landing. I’d resolved to decide whether to continue the trip in the morning. Stepping out onto the balcony it was clear enough – blue with wisps of high cirrus – to doubt myself – although there was some crud up the valley which looked like it might develop. 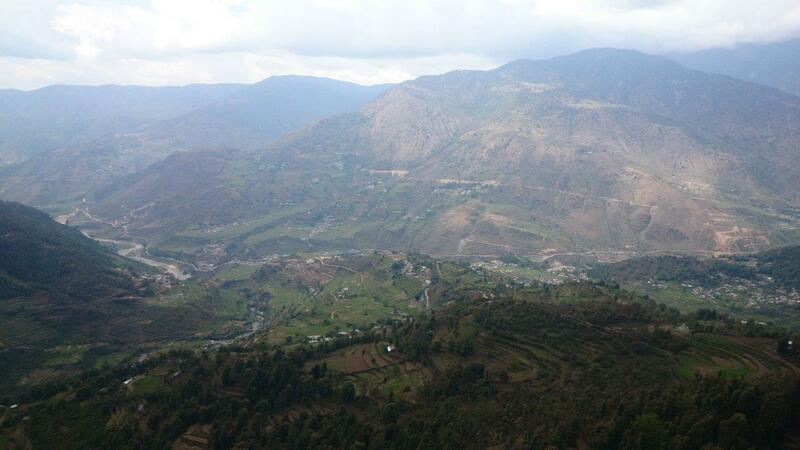 But I had to have a look – so I took a shared taxi up the valley. Half way up I saw cumulus with a low base and already rising in plumes into the upper atmosphere so I promptly disembarked and waited for a jeep from the other direction, making it back into town just in time for the last 11am bus to Rishikesh. While in the bus the views of high cumulonimbus developing early affirmed my decision and it was pouring well and truly by the time we arrived. Bryan and Kat would join me the next morning. We’d had a good time but my favourite memories of strong thermals and snowy Himalayan peaks were short lived before returning to the humid gloom we’d already experienced in Bir. I had a heavy load and warm clothing expecting to be flying up over 5000 metres so it was not conducive to trudging through valleys and being nimble on tricky launches. It has been unseasonably wet (April is normally the second driest month) so these conditions were not to be expected. 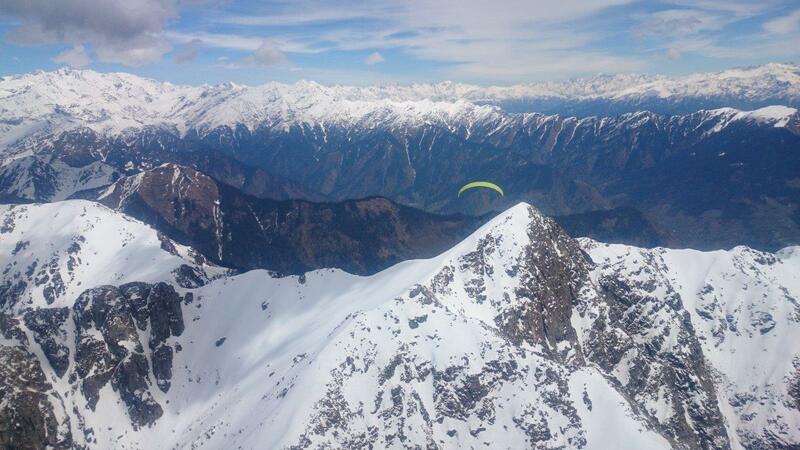 Our main goals are to fly amongst amazing terrain so we made plans to head for Manali to be positioned ready for the next good weather window. 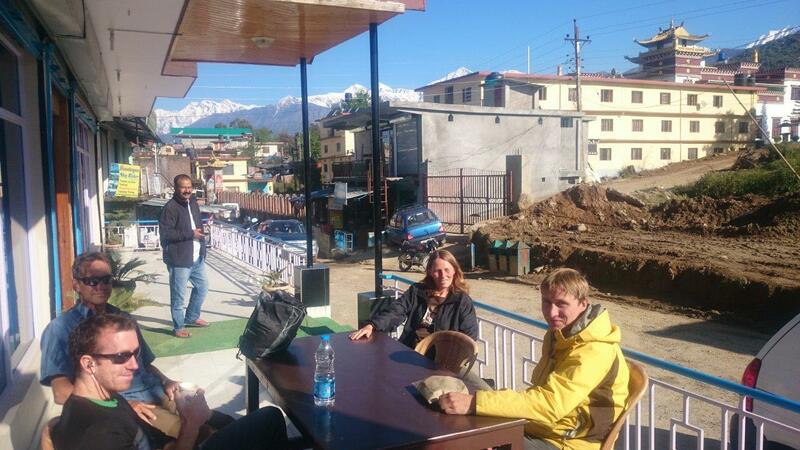 We’d also specifically planned our trip to avoid border areas so it was highly disappointing to (apparently) run into trouble with the authorities in Uttarakhand – I longed for the lack of bureaucracy and grassy hills of Kyrgyzstan! But on the right day the flying is incredible – so we are looking forward to seeing what we can do in our remaining time here. 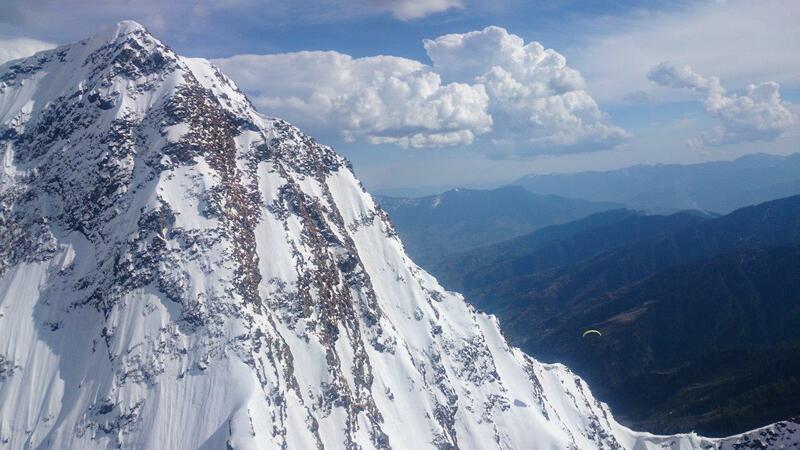 This entry was posted in Uncategorized and tagged adventure, himalaya, paragliding, parapente, share my joys, vol biv. Bookmark the permalink. Great story Nick… Well done in difficult conditions!!!! Thanks for sharing the journey Nick. Keep the stories coming, I am living vicariously at the moment through you all! You certainly made the most of the conditions at least! Always good to share your joys nick. This time tales from the Himalaya – motivating and inspirational. Fond memories of Bir, crap conditions for you this time but as always you make the most of it, good reading. Great narrative, Nick. Shame the flying wasn’t better, but sounds like you enjoyed it anyway.